While I may spend most of my time writing seemingly conventional non-fiction, I’m actually very interested in the mechanics of interactive storytelling – whether used in fact or fiction. That’s partly due to time spent reading those old Choose Your Own Adventure books as a kid. But it’s more because of my professional adult life. I’m used to developing textbooks that readers dip in and out of at will, online learning courses designed specifically so users can choose their own path through different experiences, and exhibitions where you can’t control the route your visitor will take, what they choose to look at, or in which order they will see things. In all these instances, however, there will be communication aims, learning objectives or affective outcomes you want or need to get across – the challenge is doing so even if your reader/visitor doesn’t read/interact with everything, or if they explore material in an ‘unexpected’ order. 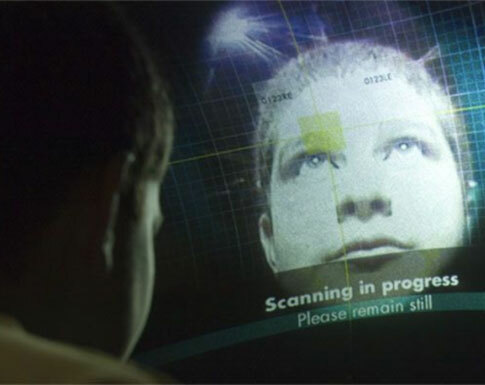 That challenge was especially tough when I worked as Content Manager for the Science of Spying, an interactive exhibition designed for families, which launched at the Science Museum, London in 2007 and travelled to other venues in the US, Canada, Spain and the UAE. Unusually for a museum exhibition, we chose to use a fictional narrative as a thread running through the entire experience. Because visitors explored the topic of how science helps people to spy through interactive exhibits, we often needed someone or something to spy on. Rather than inventing different targets for each exhibit, we decided to link everything together in one story. You started the exhibition in training, testing out your skills by spying remotely on a suspicious organisation known as OSTECK. 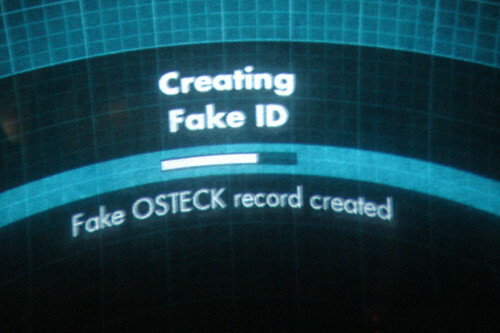 If you did well, you received a mission to go undercover within OSTECK. There you were tasked with tracking down a secret codeword in order to steal the antidote to a world-threatening communications virus. Finally you had to make your escape. How were we to communicate all this information when we printed hardly any gallery labels (on the basis that most people never read them anyway) and didn’t hand anything out except for a swipe card needed to access some of the interactives? 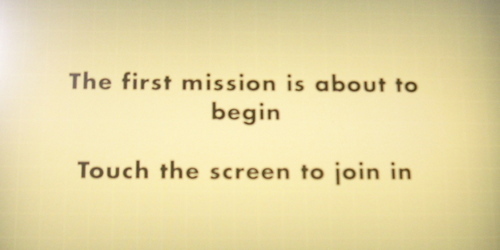 More importantly, how did we get the message across through visitors’ on-screen experiences without either annoying them by repeatedly stating it or under-informing them if they failed to play certain games? As with the development of most exhibitions, we used evaluation panels to test many of our early ideas and exhibit prototypes. I therefore spent a long day or two preparing a detailed paper-walkthrough of the entire exhibition, with the narrative reveals hidden under paper flaps that visitors could choose to explore or not. We trialled this on helpful visitors in the Museum, some of whom found the experience rather confusing. However, most people did pick up the fact that OSTECK was up to something, and that a hirsute figure named Mr Grant might also be involved – no matter which exhibits they had explored, or in which order. Encouraged, we ploughed on, though with some trepidation; evaluation can be a very powerful tool, but lifting flaps on a paper walkthrough could never simulate the experience of working your way through an exhibition abuzz with over-excited children and crowds waiting to access exhibits. When Science of Spying launched, it polarised opinion. Some, mostly tweens or families including them, loved it. They enjoyed tackling the different interactive tasks, picked up the story as they went, and were really keen to complete their mission in the ‘undercover’ zone. Others were disappointed. Adults who had come along expecting facts about historical spies, and who didn’t participate fully, picked up some aspects of the story, but were frustrated by not having the whole picture. While our exhibition storyline clearly wasn’t interactive fiction on the scale of Profile Books and inkle’s recent Frankenstein app (trailed below) – where you can choose on every page how to proceed, sometimes from several options – it does share some of the same logistical issues. In particular, how do you make sure certain key pieces of information are communicated without ramming them down your reader’s throat, how do you keep people engaged in a potentially disjointed story and how can you provide meaningful different responses so readers feel they are getting a genuinely personalised experience? These are also issues I’ve faced when working with Full Beam Visual Theatre to devise themes and content for a ‘promenade’ theatre performance inspired by the life of Charles Darwin, The Lesser Spotted Collectors’ Club. If the new inklewriter tool for “telling interactive tales with the minimum of fuss” had been available before, maybe we’d have had less headaches about how to spread our narrative across the Science of Spying exhibition or the theatre performance. Or maybe we’d just have got carried away and ended up writing our own more detailed OSTECK or Darwin-themed story (there’s two interesting ideas….). Future Voices is open for entries now. Just submit your piece using inklewriter by September 15th and you could end up with a published story and $250 in your pocket. Full details are avaliable at inkle.